In 2015, Runner’s World named the Crazy 8s 8K as one of 25 Iconic American Road Races. Blue Ridge Outdoors Magazine named the Crazy 8s 8K Run the Top Road Race of 2008. Cherry Blossom 10-Miler – Washington, D.C. In 2017, through Race to Raise Charities, Crazy 8s raised nearly $6,000 for local non-profit organizations. 1980s – The Fun Fest road race goes back to 1981 with the beginning of Fun Fest. The first race was run on Bays Mountain, but moved to the Ft. Henry Mall a year later. 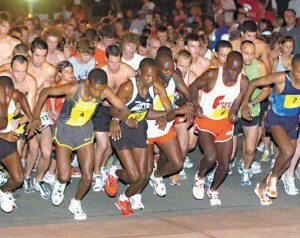 The race, named the Fun Fest Midnight 5 Miler, became the “kickoff” event to Fun Fest as a Friday midnight event. 1990s – In 1990, the event changed to the Crazy 8s format, adopting a new 8-Kilometer course with a unique figure-8 design and candle-lit streets. Crazy 8s also moved from Friday night to Saturday night, and moved its start/finish down the street to the Greenacres Shopping Center. A walk was also added in 1990, and Little 8s Youth Runs in 1993. In 1996 Peter Githuka shocked the world by running a new 8K world record at Crazy 8s. 2002 - Asmae Leghzaoui broke the women’s world record in 2002, crossing the finish line in 24:28. Crazy 8s became one of only a few races in the world to hold both genders’ world records. 2006 - In 2006, the event uprooted and moved to J. Fred Johnson Stadium with a thrilling finish inside the stadium. In 2006, the Healthy Lifestyles Expo was introduced along with a new name for the 3k Heart Walk – Neil’s Walk, named in memory of a good friend, Neil Danehy. 2007 – Special 8s, an event for individuals with special needs, was born, and the $5000 Dash-For-The-Gold was introduced. 2008 – Blue Ridge Outdoors Magazine named Crazy 8s the top road race of 2008, finishing ahead of such mega-races as the Peachtree 10K in Atlanta and Cooper River Bridge Run in Charleston. In November of 2008, the Tikrit Running Club, a group of runners from the U.S. Army base in Tikrit, Iraq, staged the first ever Crazy 8s 8K Run in Iraq. Crazy 8s also received the Gold Award for Best Event within an Event at the 2008 Southeast Festival and Events Association Kaleidoscope Awards. 2015 – Silver Anniversary – 2015 was the 25th Anniversary of Crazy 8s with 25 years of awesome and “crazy” memories! In 2014, Crazy 8s had over 4000 participants for the first time in the history of the event. 2017 – Totally Crazy. Crazy 8s went “Totally Crazy” by offering a 3K/8K combo and timing both events. Participants who finished both events received a very unique and cool Totally Crazy medal in which the 8K medal fit inside the larger Totally Crazy medal.